Summer is showing last warm signs but kids still full of excitement and adventurous mood. Bouncers bring favotite fun activities for children, even adults take courage to have some extra jumps with kids. Today we welcome you to Fun House Bouncer Sweepstakes sponsored by: LittleTikes.com and organized by: Mom to Bed by 8. 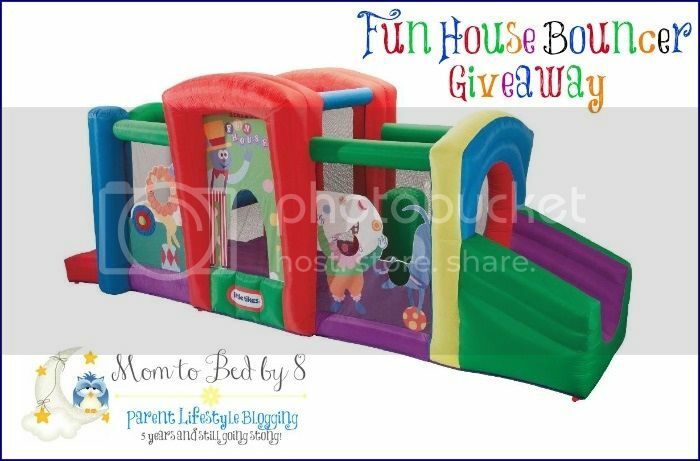 Please take a moment to read Mom to Bed by 8's Little Tikes Fun House Bouncer review and see how a boring summer day can be changed in less than 5 minutes! Kids can get their wiggles out with the ultra-fun Little Tikes State Fair Fun House Bouncer. This circus-themed set features lion, clown and dog silhouettes on the outside. A convenient exterior storage pocket offers a place to leave shoes. Three distinct areas, including a slide and ball toss area, provide plenty of room for play. High walls keep children within the unit as they jump, for reliable safety. The weight capacity is appropriate for up to three children. Assembling the Little Tikes Bouncer requires just one person, and the unit is constructed with heavy-duty PVC material. Mesh windows help parents keep a close eye on their jumping children. Special thank you to our supporting co-host bloggers: Newly Crunchy Mama Of 3, Memoirs of a Clueless Woman and Everything Mommyhood. I love the Sand And Sea Playtable.